I have been trying to find out more about the potion Kraven uses/used to get his enhanced senses, strength and to suppress his aging, but I've come across conflicting information. 1. Marvel Wiki names the potion 'Calypso Serum' or 'Kraven Serum' and states it was created by a witch doctor named Calypso Ezili, who is further presented as a Tahitian voodoo priestess and seems to act mostly in the US. In the article concerning the serum, nothing indicates it is taken regularly and the phrasing that Calypso "gave this to her beloved Sergei Kravinoff" seems to imply a single take of the potion. 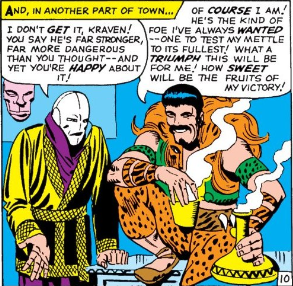 However, the article on Kraven ends with a statement that implies his great strength is only active 'While empowered by his mystic potions', even if nowhere else in the article is there a reference to a regular taking of the Calypso/Kraven Serum. Quite the opposite, the sentence 'After meeting a Voodoo witch doctor named Calypso, Kravinoff took a herbal potion [...]' gives the idea the potion was taken a single time. Moreover, the whole thing begs the question: is the potion mystic (therefore brewed by a witch) or a simple herbal potion (therefore breweable by anyone, including Kraven)? 2. 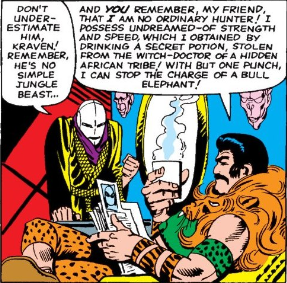 At a blog entry listing 10 facts about Kraven, it is stated that Kraven stole a herbal potion from a witch doctor in Africa. Was Calypso in Africa at the time or is this a different potion? Once more, there's no reference to the potion having to be taken regularly. 3. 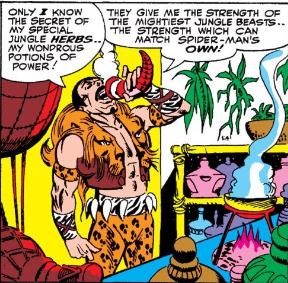 At wikipedia, it is referred that Kraven must ingest the potion regularly, which he himself makes from jungle herbs. There is a reference to Calypso Ezili being his lover but no reference to her being the author of the potion. Having collected this conflicting information, I'm left wondering if the authors of those articles left out information or if the stories themselves give conflicting accounts. Up through the late 1980's, Kraven's story was pretty simple. 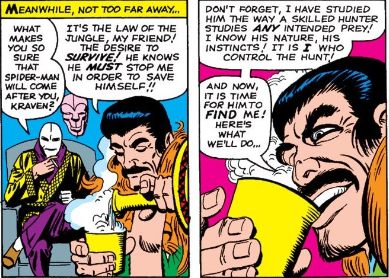 While that could just be Kraven's coffee thermos, it certainly seems possible that it's the potion he refers to. Only I know of my special jungle herbs ... my wondrous potions of power! They give me the strength of the mightiest jungle beasts ... the strength which can match Spider-Man's own! Note that, in every scene in his first appearance, he's with the Chameleon. Future stories would seem to indicate that they were not actually equals. Kraven may have been fudging the truth around the Chameleon, to avoid revealing his secrets. I'll also note that this is the last Kraven appearance drawn by Steve Ditko. I don't believe other artists have necessarily chosen to portray him drinking his potion. We see little if any sign of it in his appearances over the next few decades. Kraven continued to fight Spider-Man (and other characters) for a long time. However, in late 1987, Marvel published a 6-issue story through all three Spider-Man comics (Amazing, Spectacular, and Web of), ultimately titled "Kraven's Last Hunt". Kraven beleives he's finally killed Spider-Man, and tried to take on his identity. Spider-Man is not dead, and Kraven chooses to end his own life at the end of the story. This being comics, that's not the end of the story. First, in the new Spider-Man titled created for him, Todd McFarlane (co-creator of Venom, and the creator of Spawn) tells us a story about a lover of Kraven's, who claims to have created the potion for him: Calypso. While she had appeared in two previous stories, and probably was Kraven's lover at the time, she didn't seem to have a personal hatred of Spider-Man; she mostly seemed to use Spidey as a goad to egg Kraven on to doing things. However, in Spider-Man (1990) #1-5, in a story titled "Torment", she displays mystical abilities of her own. I don't recommend actually trying to read "Torment" - it's not pleasant (not due to it being a horror story; rather, due to it being McFarlane's first attempt to write a story). She appears a few times after that, again displaying mystical abilities far exceeding any capabilities Kraven had ever shown. In spite of that, it's not clear that she is telling the truth about being the original source for Kraven's potion; it seems more likely that she was his student, not his teacher. We do learn that Kraven had a wife and several children, some of whom choose to follow in his footsteps. Vladimir Kravinoff becomes the Grim Hunter, and tries to kill Spider-Man. Another son, Alyosha Kravinoff, initially clashed with Spider-Man, but eventually became a somewhat heroic character, before cashing in to become a reality TV star. He also killed Calypso. However, Kraven's wife and daughter, Sasha and Ana, were responsible for bringing the original Kraven back to life. He came back as a psychopath, and claimed to be cursed and unable to die. Spells and potions are mentioned as the means by which his family brought him back to life, but nothing is said about whether he still needs to take potions to gain superhuman abilities. It may be possible that, since his resurrection, he no longer needs to take the potion regularly; he may have gained his potion abilities permanently in the process. However, there's no real evidence pro or con that I've found. In his most recent appearances, he has been portrayed differently for different stories. In particular, in his appearances in Unbeatable Squirrel Girl, he seems to have been convinced first to hunt monsters (like Giganto, the whale-like monster Namor once unleashed on the surface world), and, later, decides he will "hunt the hunters". In these stories, it would seem like he's turned over a new leaf. However, we do see him elsewhere, such as in Old Man Logan, where he decides to kill Logan so he can die in battle, since Logan seems to be deteriorating. Logan, understandably, takes exception to this. To the best of my recollection, none of these recent stories mention his potions at all. I do not believe that it's ever been established just where the potion originated from, or how long ago Kraven took it. Calypso may have been the witch doctor - if we believe her story. She may have been someone Kraven eventually trusted to help him make the potion, and not been its actual creator. From his early comments and appearances, I would guess he had to take the potion regularly - possibly daily. His comments in Amazing Spider-Man #34 would tend to indicate it was simply an herbal potion. However, his resurrection seems to imply that Kraven had some knowledge that delved into the mystical. It's unclear if that knowledge was a part of the potion. I'm not aware of any issues that clarifies where the jungle herbs came from, or whether they only exist in one particular location, or can be found in multiple jungle throughout the world. I will note that we've seen Kraven in the Savage Land on more than one occasion. Given the relatively unique nature of the flora that can be found there, and the fact that there's both alien involvement, and old tribal civilizations about, it's not impossible that this could be the source of the herbs. In fact, we also know that the Savage Land is one of two sources of a metal called vibranium (although the Savage Land and the Wakandan versions of this metal seem to have radically different properties). We also know of a specific, heart-shaped jungle herb that the Panther uses to enhance his abilities. Perhaps there's a connection there - a Savage Land herb that has similar effects to the heart-shaped herb the Panther uses, but isn't guarded by a country like Wakanda. Note, however, that this is all totally speculative; I have no story references that would support these theories. 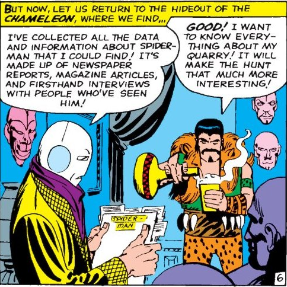 And, this again supposes that Kraven is deliberately misleading his old "friend" the Chameleon in his first appearance. The main source of the conflicting information seems to be Calypso, and her stated part in Kraven's past is definitely a retcon. It's not entirely clear that she was telling the truth, since when she starts talking about her role in things, Kraven wasn't around to confirm or deny. She doesn't seem to have any mystical powers in her first appearance, and it seems reasonable to believe that she's constructed her own reality after Kraven's death, and increased her significance to him. She may even believe it, by that point. Not the answer you're looking for? Browse other questions tagged marvel comics or ask your own question. Do some Walkers employ ambush hunter techniques? Are the 'Weapons Plus' program and 'Weapon X' program related? What is Johnny Dee and the thing on his chest? In the Asterix series, Why didn't the Romans just address the magic potion problem head on? Which was the X-Men comic where the mutant Santa Claus appeared, and what are his powers? What made Galactus change his mind and leave earth all of a sudden?